The Ground Floor of the surviving Bath House on Hot Springs Island. There's a second floor, a maintenance level, and a cave level containing The Contraption that heats and pumps all the water. 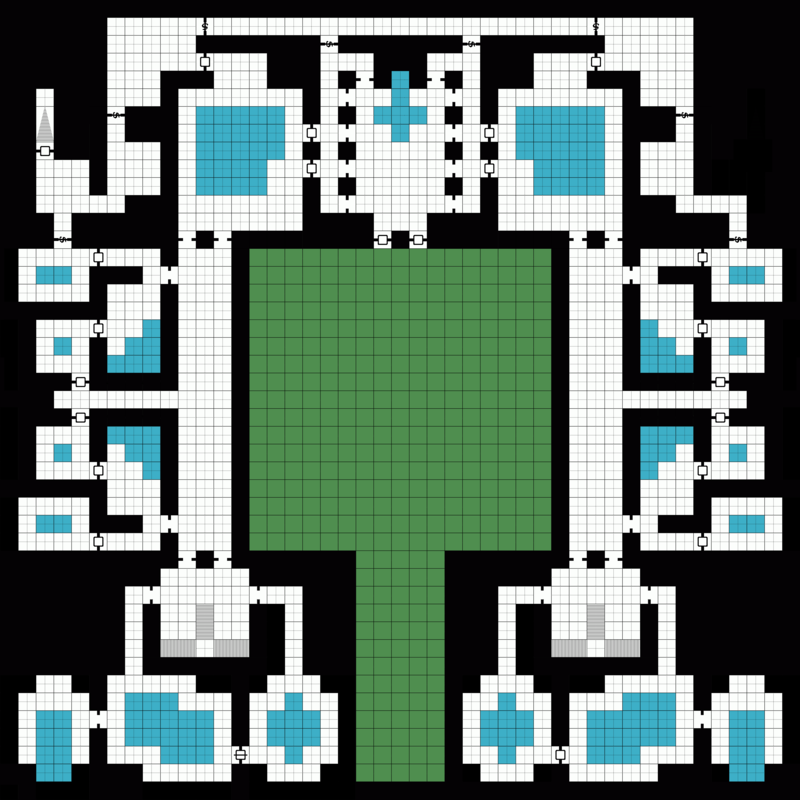 The goal was to map out the "pristine" version, then I'll go in and hit it with destruction by collapsing walls, floors, etc. The area colored green indicates areas on this level that are not technically inside the dungeon. This includes the entrance to the establishment and the large "Loitering Garden" before the "Grand Entrance" to the Baths. Blue areas indicate pools. Many would have been thermal, but there were likely cold springs and mud pools too. Full details still undecided. While the secret doors would not have been very secret to the Elven clientele of this establishment they served as the servant paths for the cleaning/restocking crews, and so were unnoticed in their own way. As I make this post, I realize that I'll need to have some stairs going up to the second level from the servant areas as well. I worry that it's too symmetrical for a dungeon, but since this was originally built to be a pleasure house, I think it will work once some destruction due to time kicks in. Edit: Each square is 10' so this place is HUGE. What program did you use to make this map?